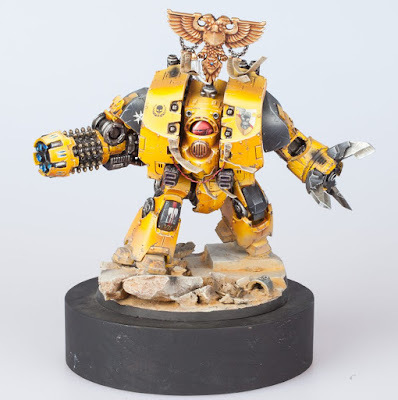 The Leviathan Dreadnought is one of those undeniably cool models that Forge World makes. I would go as far as to say it's one of the best Dreadnought models currently made. It has so much presence and weight to it. The way it's been posed here really make this lumbering giant feel like it's reacting quickly in the heat of battle, something that's unique for such a large vehicle. I don't know how much of this is conversion and how much of it is just due to how posable the model is, but it's a great pose and really shows off the mini. On top of that, I'm definitely a fan of the Imperial Fists. 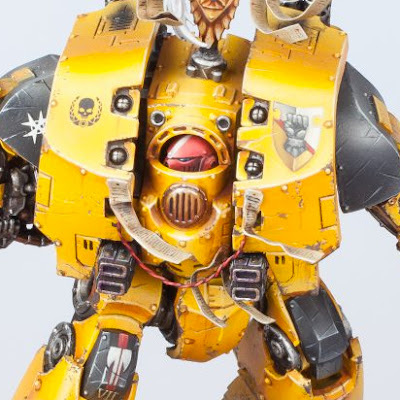 Yellow is just such a striking color, especially when paired with the black we see on most Heresy era Fists. The bright color really catches your eye, and allows the painted to go to town with some spectacular fades, as is the case here. Everything is smooth and crisp, and I really like the orange tone in the shadows. The addition of the banner from the Custodes gives it a nice little bit of bling, while the base is equally subdued and realistic looking. It frames the model, but doesn't really contrast with it, ensuring that the overall warm feel of the mini isn't broken. The contrast on the base comes from the chalky, natural look of the sand, compared to the smooth, saturated look of the armor. Seeing a whole force like this would look spectacular and this model definitely deserved its award at the Golden Demons.